Tocharian B text THT 496, in cursive script, containing a literary poem, "Love letter". From CEToM database. This blogpost will give an overview of my popular lecture earlier this week on the role of patterns in syntax, grammar and literature for the deciphering of ancient languages (link to the lecture below, in Swedish). My own experience on ancient language deciphering is basically restricted to Tocharian. On the other hand, Tocharian texts can be very difficult to understand, in particular if parallel text in Sanskrit, Khotanese, or Uighur (the most frequent translation languages for Tocharian) are absent. Deciphering of ancient languages basically uses three instruments: script, language (lexicon and grammar), and literature. Reading the script is fundamental to understanding the content, and also in a phase where the content of a manuscript is known, there is often reason to go back to the manuscript and check the reading, which may open for new interpretations and renewed understanding of content of the text. 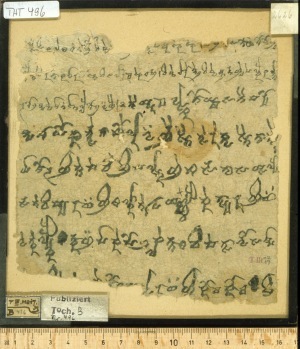 In case of Tocharian, the script (North-Turkestanic Brahmi script) is relatively well known, even though there are some Tocharian B texts in cursive script that are very complex and difficult to interpret. 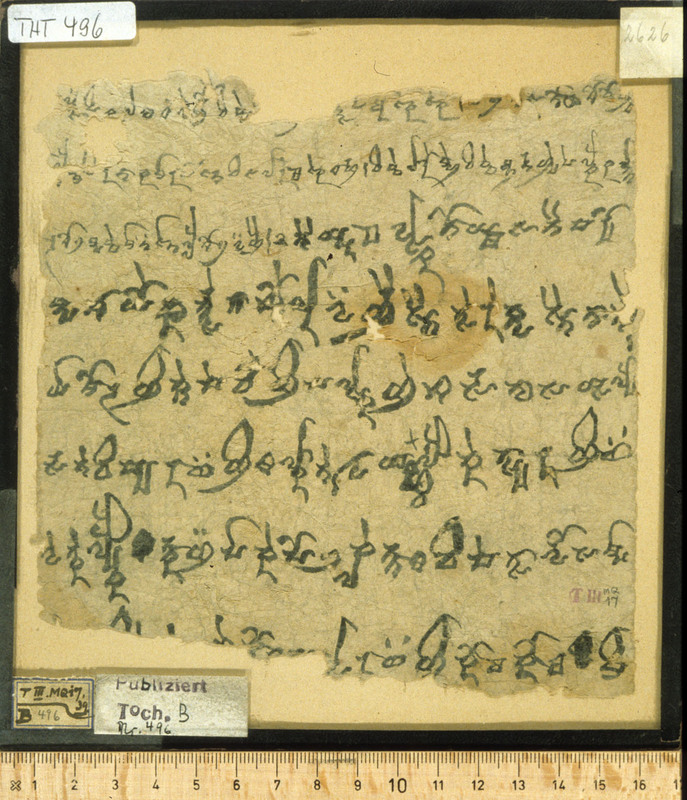 On the other hand, almost all Tocharian texts are fragmentary in some aspects (burned, broken, etc. ), which means that lacunae have to be completed and reconstructed. Parts of this reconstruction is to interpret the chacacters at manuscript edges, which may be cut or damaged. This indicates that even if the script is known, the work of a philologist still implies a substantial amound of manuscript reading. Interpreting lexicon and grammar may imply substantial problems, if the language is not well known. In the case of Tocharian, the broken contexts, again, create large difficulties when we study syntax. Morphology is easier: paradigms can be established and reconstructed from forms found in texts, and there are few missing forms in the context of grammar forms in Tocharian. However, syntactic constructions require a larger corpus of complete sentences, and in a language such as Tocharian, there are often problems of finding enough complete sentences (that are not restored) for certain constructions, for instance in combination with a specific verb. The lexicon has its own difficulties. In a language like Tocharian, the absence of close relatives is a problem (Tocharian descends immediatly from the Indo-European proto-language). If an unknown word is found in a text, we may assume a meaning based on the meaning of a presumed cognate in another Indo-European language. However, the connection to the presumed cognate may be a complete mistake and instead the meaning of the lexeme, as well as the etymology, is something entirely different. This brings us over to the third category, literature. Besides script, literature is probably the most important of the instruments mentioned at the beginning of this text. The exact meaning of words, which form the basis for a correct interpretation of a text, is highly related to the possibility of "proving" the content by a parallel or bilingual text. Most Tocharian texts are translations from Sanskrit, but besides that, Tocharian had its own literary tradition. Therefore, the exact source of a text can be difficult to trace. Some texts do not have any source texts at all. Since Tocharian, like any other literary language, is constrained by its literary tradition, the identificaiton of parallel patterns in, e.g., Sanskrit literary sources, are highly important to a proper understanding of the content and a correct translation of the lexical meanings and the syntax. Link to a public lecture at Filosolficirkeln, Lund, about deciphering ancient languages.